Ancient Greece is rightfully regarded as the cradle of European civilization. It produced unprecedented creativity and innovation in literature, painting and sculpture, politics, theater, architecture, and so on. The Greeks’ most important contribution by far, however, consisted in what we might call an expansion of the abilities and scope of the human mind. They were able to free themselves from the constraints of culturally conditioned narratives, which millions of people are still trapped in to this day. These narratives are unquestioned beliefs and assumptions that are taken for reality. They are an intrinsic part of the conditioning of the mind. So one could say that the Greek philosophers taught us how to think. It is generally recognized, and taught at universities, that within the European cultural context, the civilization of ancient Greece gave rise to rational thought and ultimately laid the foundation for the development of science. This is all true, of course, but if that were the whole story, there would be no need for this book. It is not the whole story by any means. It is only one half of the whole. There is a dimension, which we could call spiritual, to these ancient philosophers’ work that has been not only largely neglected by academic studies but actively suppressed. It is my view that their ability to think creatively and go beyond the confines of their mental conditioning was because they were able to access, to a greater or lesser degree, this dimension within themselves. The subject matter of this book is not just of historical interest. It is of vital relevance to our civilization at this time, which needs to rediscover its roots in that spiritual dimension if it is to survive, just as individuals need to discover that dimension within themselves in order to transcend the dysfunctional egoic state of consciousness that is the main source of human suffering. Wisdom arises out of awareness. Wisdom can manifest as thought, but the root of wisdom lies in “no thought,” or freedom from thinking. That is why Socrates said: “Wisdom begins in wonder.” What is wonder? The dictionary gives various definitions. The one that applies to the saying of Socrates defines wonder as “rapt attention or astonishment at something mysterious or new to one’s experience.” So when he speaks of “wonder,” Socrates clearly refers to a state of alert inner stillness in which there is no thinking. There is awareness, but no narrative, no interpretation or explanation. This is corroborated by another one of his most famous, but usually misunderstood, sayings. When he was asked why the Oracle at Delphi called him “the wisest of all men” he replied: “I am the wisest man alive, for I know one thing, and that is that I know nothing.” This statement is often interpreted as feigned modesty (which, of course, is a form of ego), but I would suggest that he was referring to the state of “not knowing” that precedes any creative use of the mind. In that state of alert inner stillness we connect with the unconditioned consciousness, so that we are no longer trapped in the conditioned mind. Plotinus puts it like this: “Leaving all thought behind, [the soul] releases itself into silence.” The mind then becomes the instrument of a higher faculty instead of being self-serving, which is ego. The state of consciousness that Socrates describes as “wonder” then prompted questions—questions that hadn’t been asked before in the European cultural context: What is the nature of the cosmos? What lies behind the world that is accessible to us through sensory perception? What is goodness, virtue, love? Is there a Supreme Being? What is the optimal way for humans to live together? What are the ethical precepts for the conduct of our lives? And then they came up with answers, which were not definitive, and therefore didn’t lead to dogmatic belief systems but remained provisional and explorative. This meant that there was always room to go deeper. The dictum “Know Thyself” inscribed at the temple of Apollo at Delphi pointed to the most important and profound question of all: Who am I? The answer to this question, of course, could not be a conceptual one, but would have to be experiential. Find the answer to this question, and it will transform you and your life! We could say that the very prerequisite for any creative thinking is accessing the unconditioned consciousness within, which is the spiritual dimension. Discursive thinking becomes barren and even destructive when it has lost connectedness with that dimension. In other words, knowledge arrived at through rational thinking alone, lacking in awareness that engenders, wisdom, is a dangerous thing, and the greater the knowledge, the more potentially destructive it becomes. These ancient sages knew that the most important task for us humans is conscious connection with the spiritual dimension. Virtue, love, right action, and creative thinking arise from that. It is the essence of who we are. Hence Pythagoras taught: “People run in every direction meeting sorrow after sorrow. Why? Because they’re disconnected from themselves.” So knowledge is important, but wisdom is primary. The ancient Greek sages were primarily teachers of wisdom. Although they were seekers of knowledge, the greatest of them were ultimately aiming at the transformation of the human being, which means the transformation of human consciousness. Although the knowledge they gained laid the foundation for science, most of them had more in common with the traditional Indian gurus than with modern-day scientists or academic philosophers. Indeed, an important feature of this book is the clear and plentiful evidence it presents to show that many of the Greek sages were aware of and influenced by the spiritual teachings and practices of the older cultures of Egypt and, more importantly, India. Despite the fact that there is undoubtedly a collective spiritual awakening happening on our planet, affecting a certain, as yet relatively small, percentage of the total population, there is at the same time an intensification of egoic unconsciousness and resulting in violent upheavals, destruction, and the rapid demise of our civilization. The poet W. B. Yeats wrote the famous line: “Things fall apart; the centre cannot hold,” I would suggest that the problem is not that the center cannot hold, but that humans are unaware of the center, unaware of their innermost essence, which is the spiritual dimension of life. When millions of humans live in that state of unawareness, attempting to find an ever-elusive satisfaction in sensory gratification and material things, they give rise to a civilization that is “like a house build on sand, without a foundation,” to paraphrase the words of Jesus. Then there is no true transcendent value to hold the civilization together anymore, and “things fall apart.” Cleverness and even “intelligence” in the conventional, “IQ” sense of the word are not enough to hold a civilization together or to bring true fulfillment to a person’s life. 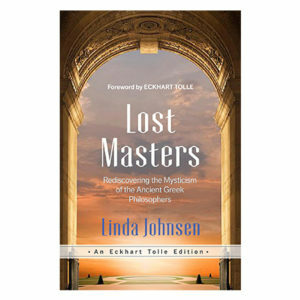 As you read this book, you will find that the long-lost masters, who lived in a distant past when the world was young and whose most essential teachings were forgotten or suppressed, are coming back to life within you. As you read this book, you will not only embark on the journey back in time to the very origin of our civilization but you will also find yourself on a journey without distance into the timeless dimension of who you are.